Changes are generally minor other than combining back into 1 document again (apart from SH houses). You can of course also comment on the other faults in the document, such as the fire spread tables that have been wrong since 2012 through 5 (?) revisions… I have 18 pages so far of comments. They may or may not fix issues you point out, but you can’t complain if you don’t raise them. Are you able to share some of your key findings? Also Engineering NZ would like to respond with a joint response from SFPE and IFE. So apart from peoples individual responses, if you (everyone not just Geoff) have anything you want to be considered for the joint response can you feed them to me mike.j@originfire.co.nz. And a few more comments in addition to the previous ones. Reminder. Consultation on the amalgamation of C/AS2 to C/AS7 into a new C/AS2 ends on Friday 30th November. For those who missed it, I hope we will incorporate the interpretation of Acceptable Solution clauses, similar to Determination “2018-048” (please see link below) into the proposed C/AS2. The interesting part about this Determination is that 5 fire engineers (the project fire engineer, FENZ, the Council, MBIE, and the Determination fire engineer) have almost 5 different points of view on the same Clauses in Acceptable Solution! Other than external spread of fire, some other hot topics (e.g. smoke lobby requirements and etc) are also open to interpretation. C/ASx is inconsistent (and less clear) than C/VM2 (commentary) on the requirements for panic bars and when they are needed, and it is also inconsistent between the 2 “deemed to comply” documents. The requirements in C/AS2 (proposed) are. 3.15.12 In retail areas serving more than 500 occupants and in crowd activities (as described by risk group CA) of more than 100 people, panic fastenings shall be fitted on doors on the escape route including exitways and final exits which are required to be secured against entry when a building or part of a building is occupied. I not also the C/VM2 commentary is incorrect as panic bars may be required on a door set with only 1 leaf that is used by more than 100 people. C/VM2 is clearer where C/AS2 could be read that it would require panic bars only on final exits, irrespective that there could be intermediate doors that serve more than 100 people. Conversely, a crowd occupancy of more than 100 people can have final exits that serve less than 100 (e.g. from a back of house area) where in strict compliance this would need panic bars as the overall occupancy is greater than 100. The requirements should also be consistent between C/AS2 and C/VM2, either in this amendment or in the next C/VM2 amendment. These are issues raised in the past by BCAs. Which clauses would you like to see altered and how would you like them to be rewritten. What is some suggested wording. my 2c on the relevant boundary question above. Firstly a disclaimer - I don’t know the details of the building or anything of the project other than what anyone can read in the determination, but it does provide a convenient example. There is a section in the determination as attached/ below. Using this example, there is a mid floor deck which appears to be enclosed above (by another deck), below (with a floor) and both sides, with a ranchslider recessed around 3m from the boundary and say 2m from the building face. There is a deck on the top floor with sun louvres so the deck is effectively open to the sky. 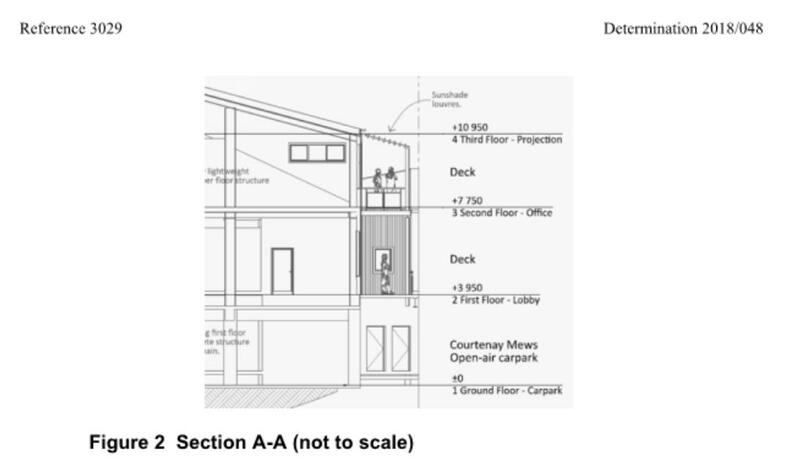 In the example of the mid floor deck, the measurement to the relevant boundary should be from the face of the building. It looks like the determination took the distance to the boundary from the ranchslider for both levels including where it is recessed. A fire on the mid floor room can’t vent other than towards the boundary, nor can it entrain air in the side of the plume in the case of external burning where the flame temperature decreases the further from the opening. In fire terms there is no practical difference between the room inside the non fire rated glass ranchslider, and the deck outside, especially as it will not be fire sterile with furniture, BBQs etc so there will be burning combustibles in this area. Where the deck is open above, then it can vent upwards as more of a free burning fire without compartment effects and radiation from the opening, or flames extending from the building. A picture would help I suspect. Regarding the external spread of fire – Clause 5.5.7, as an alternative for Risk Group WS when apex height is greater than 8m, we can only use the radiation calculations. So more details need to be provided regarding the reference for this method (I believe BRE 187 or SFPE handbook should be referenced). Regarding the smoke lobby requirements, it is not clear that if we can use Clause 3.9.3 justifications for a required smoke lobby due to the single direction of escape (Clause 3.13)? For instance, it is usual when a vertical safe path is preceded by a horizontal safe path; no more smoke lobby is required. But I recently had a long discussion for a project with Risk Group SM about it. A smoke lobby was asked in addition to the horizontal safe path. I. We understand that amendment 3 on clause 3.7.13 was added for situations that the adjacent firecell cannot meet the requirements of renew the path lengths (e.g. being in same level, having two exits, etc), but clause 3.4.2 f iii) is not updated as part of this amendment and council request the same level for adjacent firecell even when the cumulative travel distances are complied. 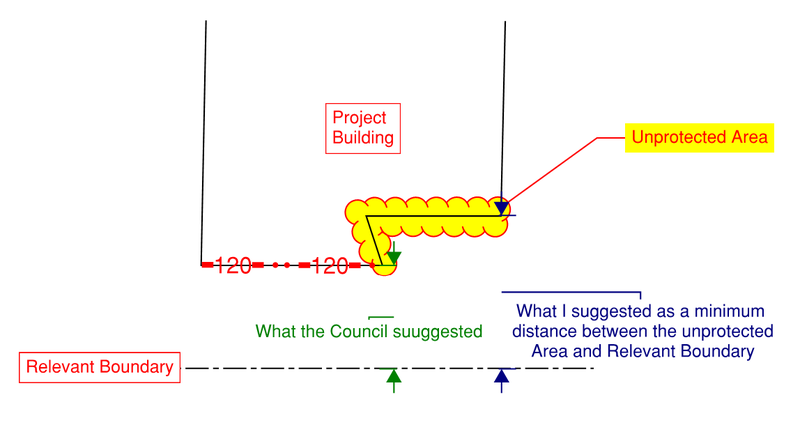 We got confirmation from MBIE that being on same level is not required and the path lengths are to comply, but the Council did not accept it. II. Our suggestion is to Remove Clause 3.4.2. f iii) “the point where the escape route passes into an adjacent firecell on the same level (see Paragraph 3.7.13)” to the second paragraph of Clause 3.7.13 “the point where the escape route passes into an adjacent firecell on the same height level” . We recently had lots of discussions about this clause to clarify if we can use the escape from a mezzanine floor to adjacent first floor firecell on the same height level.